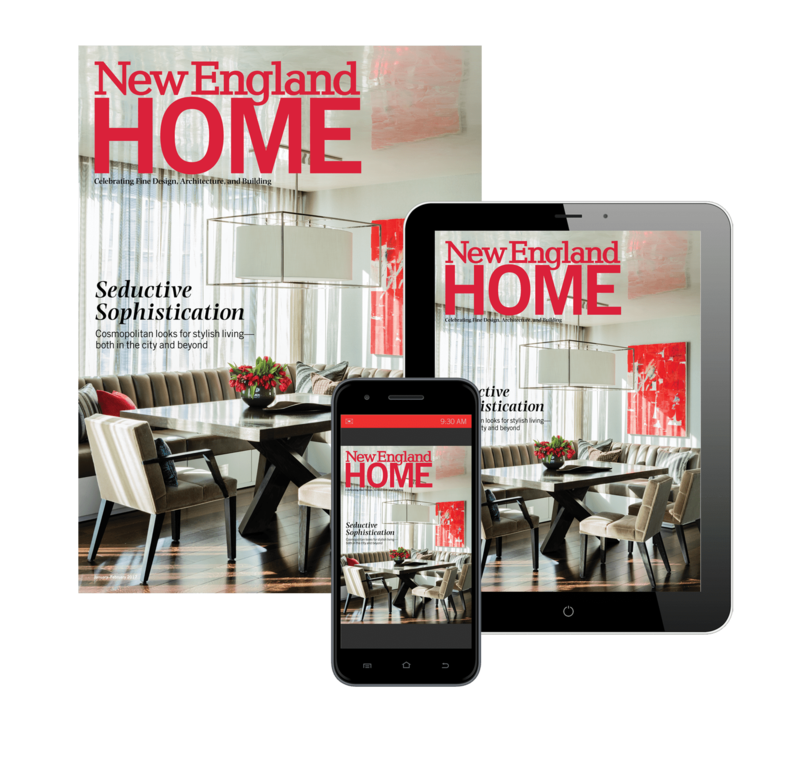 Jim Douthit, owner of Wayland, Massachusetts-based landscape design firm a Blade of Grass, has one bit of advice to those contemplating a yard refresh: don’t underestimate the power of what you see out your windows. It’s one of the guiding principles his company uses when planning major outdoor renovations. To prove just how transformative a well-designed yard can be, we asked Douthit to share five of his most breathtaking outdoor makeovers. 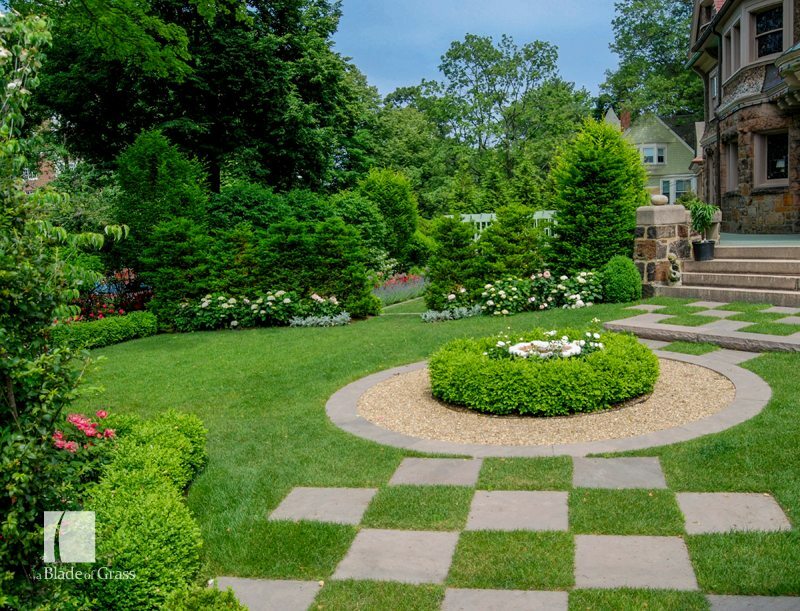 Before: The yard surrounding this Brookline home was what Douthit describes as a blank slate. “There was literally nothing on the property [landscaping-wise].” The homeowner, an avid gardener, wanted to create a cultivated vista with multiple gardens on the narrow strip of land surrounding her castle-like estate. 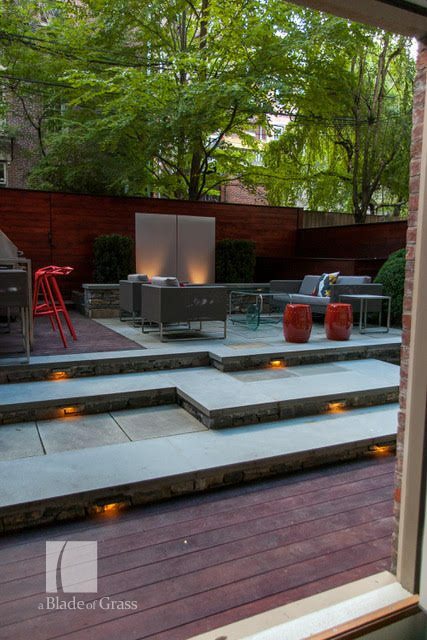 After: The solution was to break the long, ribbon-like space into a series of more proportionate “rooms,” including a vegetable garden, a formal garden edged in bluestone, and an entry garden that serves as a transition between the spaces. Because of the homeowner’s affinity for her flower beds, Douthit made sure to place some of the yard’s most stunning blooms in full view of the house. “We sectioned a lot of the high-maintenance, interesting plantings right in front of where the homeowner looks out all the time,” he says, referring to the climbing roses, alliums, and heavily flowering perennials his team chose. Before: A Wellesley family home featured a large but impractical circular drive, which took up a sizable portion of the property’s outdoor space. The homeowner also wanted to update a dilapidated garage and poorly planned landscaping. After: The team removed one side of the driveway to create a single-entry version, and in doing so freed up much of the front yard. To satisfy his client’s sophisticated style, a Blade of Grass used “a lot of granite and antique cobble, as well as boxwoods and hydrangeas, which kept it pretty tailored and elegant,” he says. “The driveway now leads to a courtyard that encourages guests to use the front door, but the clients can drive past and use their own entrance.” A chip seal driveway gives the European-style look of pea stone, but with the practicality of asphalt—a must-have for plowing purposes during New England winters. The work on the project is ongoing since a Blade of Grass continues to work on the property after installation by maintaining the client’s gardens and designer’s vision for years to come. Before: A neglected yard in Dover needed a serious spruce up. Dead plantings, plus homeowners who wanted maximum usage from the property’s limited square footage added up to a complete overhaul. Before: A yard behind a Boston brownstone, which could be seen from most of the home’s living spaces, was an eyesore: brimming with trash and surrounded by an old fence. After: a Blade of Grass heeded the homeowner’s request for a clean, contemporary space where he could relax or entertain friends by creating a simple design that revolved around the hardscaping. The building materials, like ipe wood, bluestone, and the Plexiglass paneled fireplace are designed not only to withstand winters, but to add to the overall visual landscape of the home even in the dead of winter. One of the homeowner’s favorite elements of the space: a simple water feature that runs out of a perimeter stone wall. “He really likes the noise because he’s in the city,” says Douthit. Before: “We had a chance to do a clean, modern design for a large house, on a totally bare lot for new construction,” says Douthit. The homeowner wanted a tailored, simple look, but also didn’t want to spend a fortune. After: The goal for the space was to make sure the plantings felt established, not like they had been started from scratch. In order to match the contemporary vibe of the home, the team chose just a few types of greenery, but planted them en masse. “We went with grasses and viburnums, which blended well with the aesthetic inside of the home,” he says. “One of my favorite spots is a grouping of the River Birch trees with Pennisetum grasses and boxwoods. 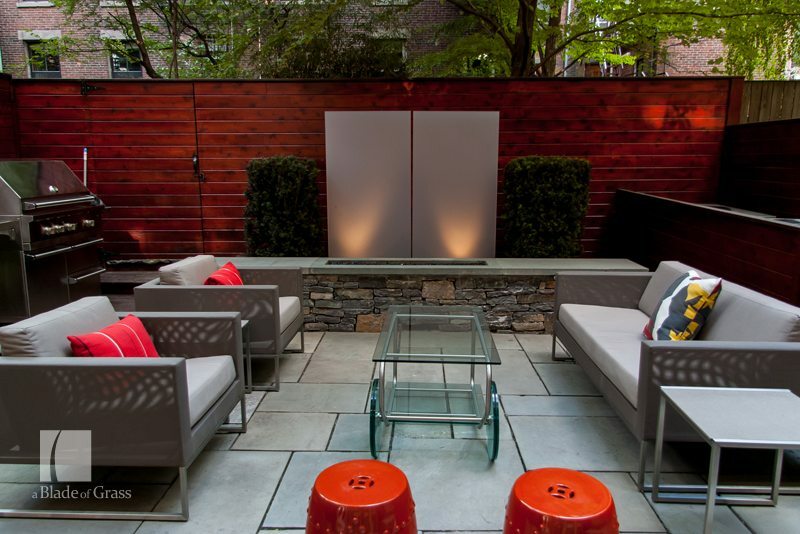 To finish off the chic layout, a Blade of Grass created a fire pit surrounded with pea stone gravel, the perfect place to relax and enjoy the new view. 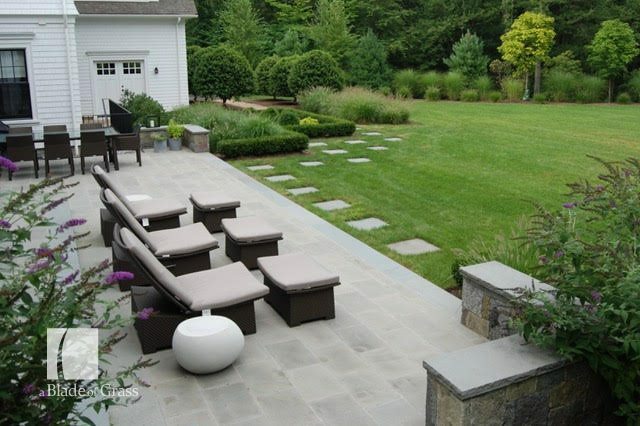 a Blade of Grass is an award-winning landscape design, installation, and maintenance firm.